Dance instructor Teresa Mason leads this class for intermediate-level hoofers who want to trip the light fantastic with style and ease. 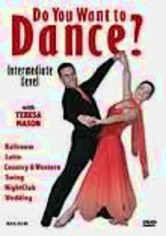 The program covers five dance styles (ballroom, Latin, country and western, wedding and disco) and 12 distinct dances. With an easy-to-follow format, Mason's lessons make learning a snap. The professional dancer reveals her "Five Secrets of Great Dancers" and offers helpful tips on poise, posture and more.